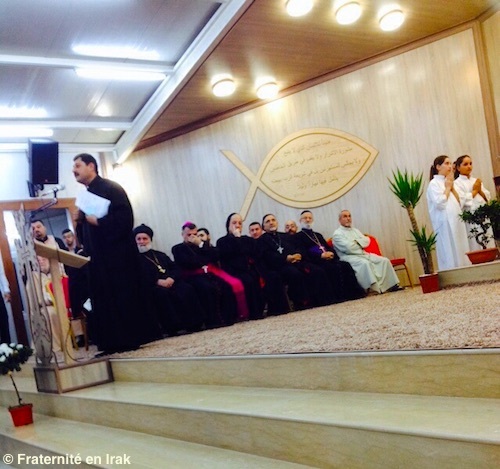 The new church for Iraqi Christian refugees is dedicated ! 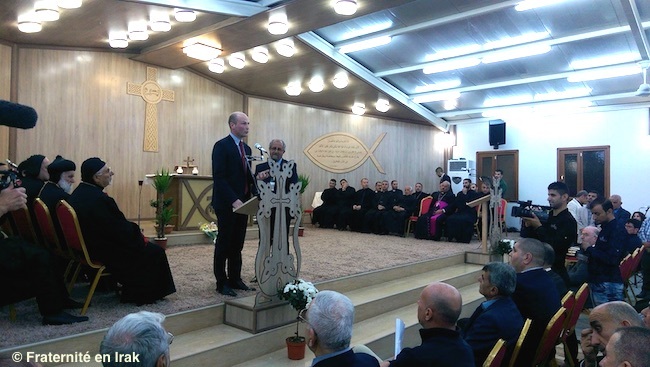 ACTION – Funded thanks to your donations, and built in less than three months, the new Sayedat el Bichara church (Our Lady of the Annunciation) for the refugees of Ashti camp, in Erbil, was officially dedicated on November 5. In the afternoon of November 5, surrounded by a joyful crowd, Mgr. 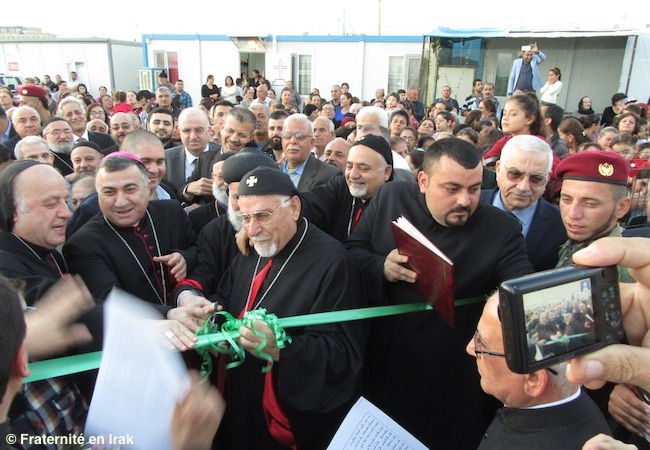 Petros Mouche, Archbishop of Mosul and Qaraqosh, living in exile in Erbil since ISIS’ offensive, cut the green ribbon that celebrated the official end of construction work and the dedication of the new church, Our Lady of the Annunciation, in the big Christian refugee camp of Ashti. 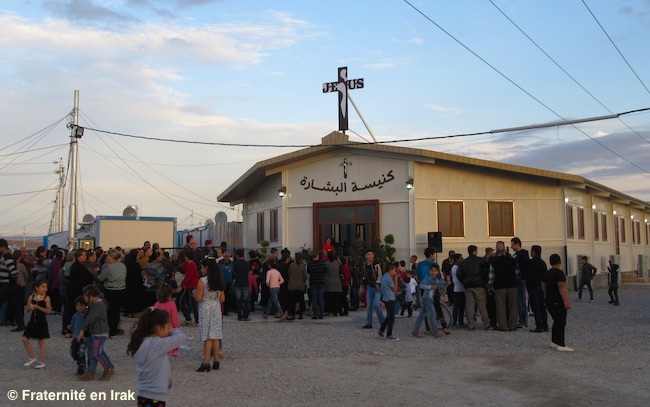 Hundreds of people rushed to discover the new building, funded and built in record time to give the 7,000 inhabitants of the camp a decent place to live their faith and gather. 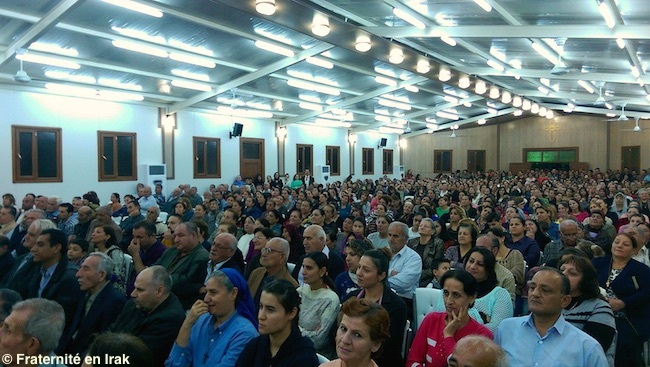 While the camp choir’s songs filled the brand new church, one thousand of believers took their seats, soon filling the aisles and any remaining space. 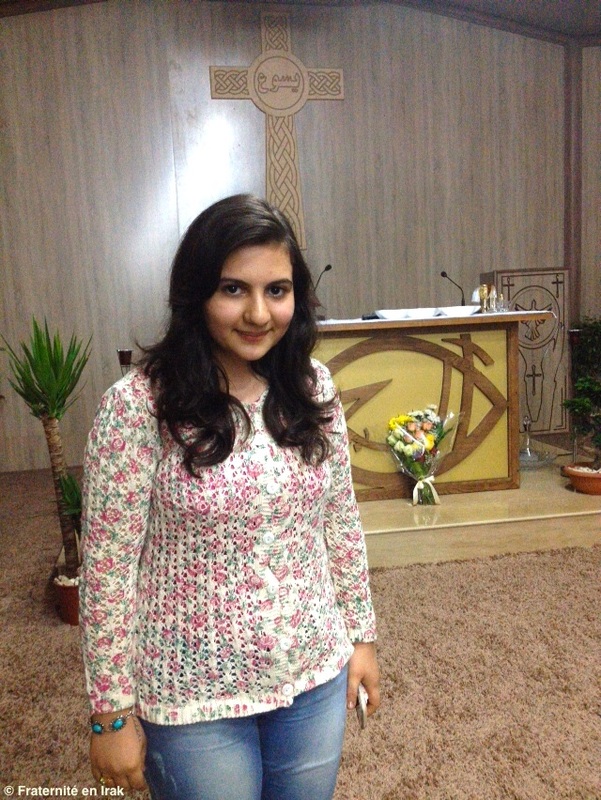 In July, when Mrs. Petros Mouche asked volunteers of the Brotherhood with Iraq to fund and manage the construction of a church in the center of a big camp for displaced people in Erbil, it sounded a bit like a far-fetched dream. But the exodus had been ongoing for more than a year, and the front line wasn’t moving in the Nineveh plain, so it became essential. 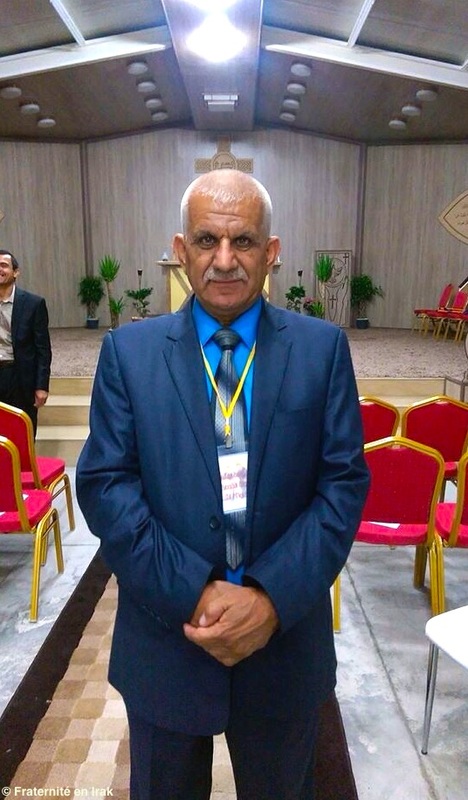 “There was a need for a place where Christians could remain themselves, living their faith in this camp, but also for a place where the entire community could gather to discus and meet — in short, a place where there would be no refugees, only human beings whose dignity remained untouched despite ISIS”, explains Faraj Benoit Camurat, President of the Brotherhood with Iraq. French donors were up to it. In less than three months, 90,000 euros were raised among hundreds of private individuals. The construction work started on August 15. On the Iraqi side, 45 workers, all displaced people from the camp, worked in shifts. The metal-framed structure soon rose, and the work site maintained a steady pace under the supervision of Monther, a loyal friend of the Brotherhood with Iraq and a wonderful site manager. At the end of October, less than three months after the beginning of the construction work, the site only needed a good sweep-up and minor finishing touches. Pictures – The construction of the church, step by step. 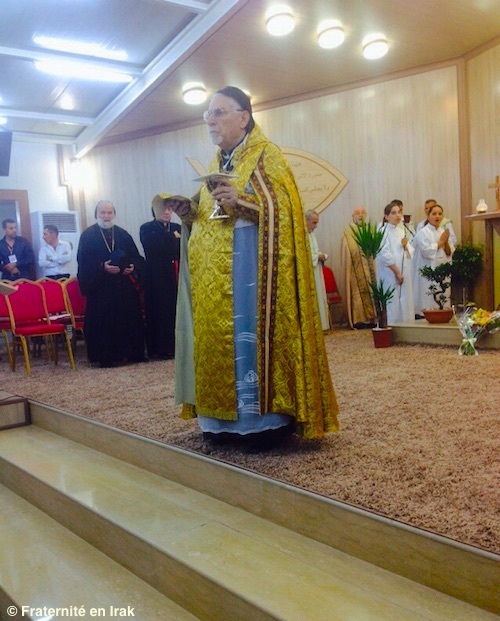 A heartfelt thanks to the generous donors of the Brotherhood with Iraq, who made this church a reality, in record time. We need you to continue to support major projects! 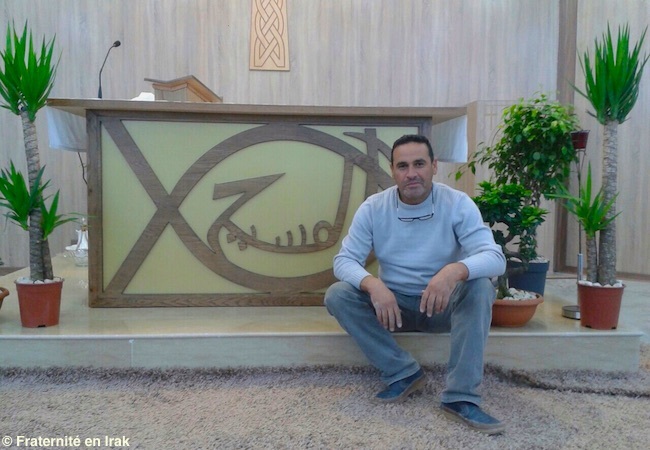 ← La nouvelle église pour les réfugiés chrétiens d’Irak dédicacée !